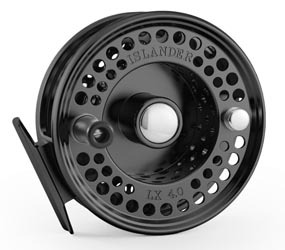 Islander reels are meticulously hand crafted in Canada from 6000 series high grade aluminum, titanium and stainless steel components. They are a pleasure to use and have remained our best selling reel in this price range. The drag features a silky smooth, frame-side, graphite impregnated cork disc system and Islander spools glide effortlessly on precision stainless steel ball bearings. All Islanders are easily convertible without tools for either right or left hand use. Every component is built to withstand the worst of salt water conditions and all models are available in either polished black or anodized gold.